Economist Christopher Thomas answers some questions regarding Mexico’s economic outlook for 2019 in the wake of the announcement of the new United States-Mexico-Canada Agreement (USMCA) and as President-elect Andrés Manuel López Obrador (AMLO) prepares to take power later this year. With Mexico's general elections ending as expected with an AMLO victory on 1 July, Economist Christopher Thomas takes a look at Enrique Peña Nieto's legacy, the biggest challenges that face the new incoming president, and of course, NAFTA, among other issues. The risk of increased tension and a deterioration in relations under the Trump government will remain high in Mexico and across Latin America. The policies pursued by the U.S. president in areas such as trade and immigration will have an important bearing, particularly in Mexico, although current developments suggest that Trump is not likely to follow through on some of his more radical campaign pledges, while the renegotiation of NAFTA that he announced after being sworn is likely to lead to adjustments to the agreement rather that its total termination. 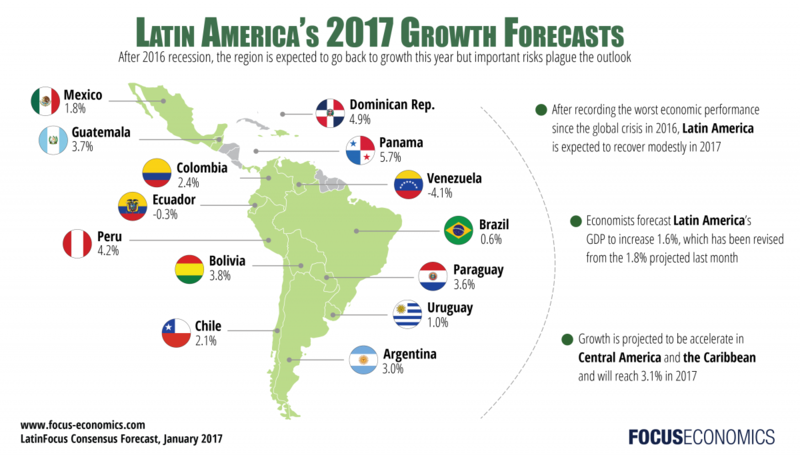 The Latin American economy is expected to recover modestly in 2017, though the outlook is plagued with risks that are causing a downward bias in analysts’ growth forecasts, according to FocusEconomics’ latest survey of 150 leading economic institutions. Economists forecast Latin America’s GDP to increase 1.6% in 2017, which has been revised down from the 1.8% projected last month. Economic data was stubbornly weak across the region in 2016 and growing uncertainty surrounding the global outlook in the aftermath of Donald Trump’s victory is weighing on sentiment, fueling concerns over the trajectory of the recovery in 2018. 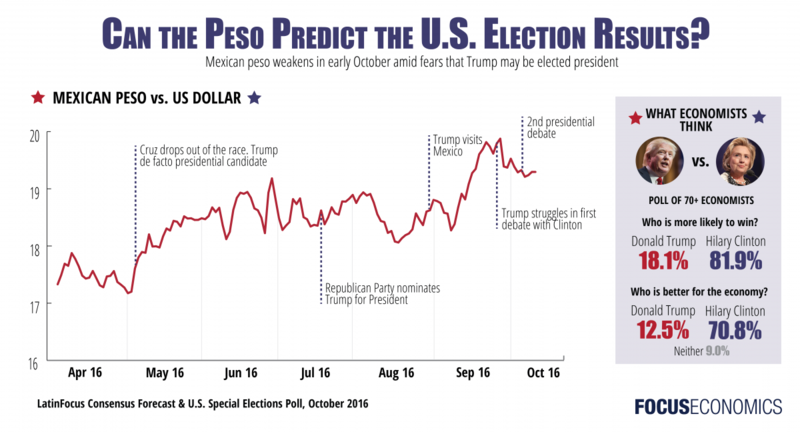 When Trump rises, the Mexican peso falls, so could the peso exchange rate forecast predict the outcome of the upcoming U.S. elections in November? 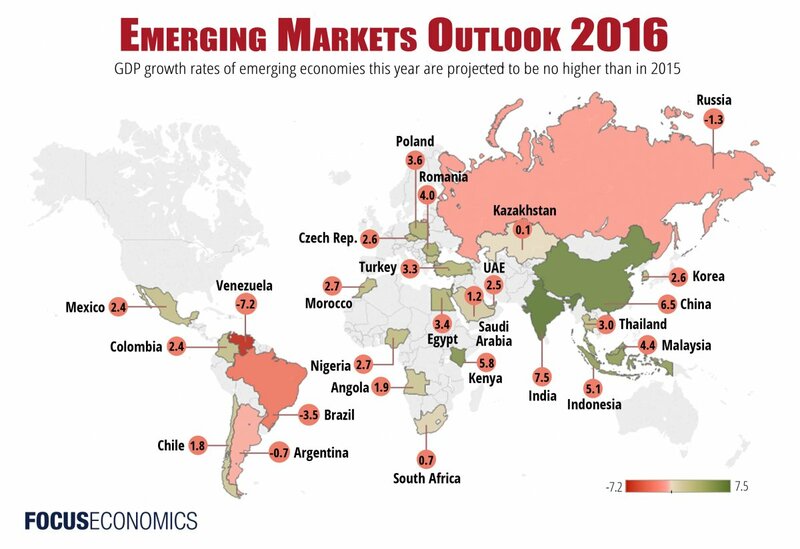 According to FocusEconomics’ Consensus Forecast, emerging economies as a whole are estimated to have grown 4.0% in 2015 and are projected to grow 4.0% combined this year. Although growth rates in general continue to be faster than those of developed economies, according to the IMF’s latest World Economic Outlook report, they remain below the average of the past decade. In 2013, Mexico’s government passed a constitutional reform, for which a slew of new legislation is expected to be implemented in the coming months. The effort to overhaul the country’s oil and gas sector is among the most anticipated liberalization efforts on the region.